This post sponsored by The Home Depot. 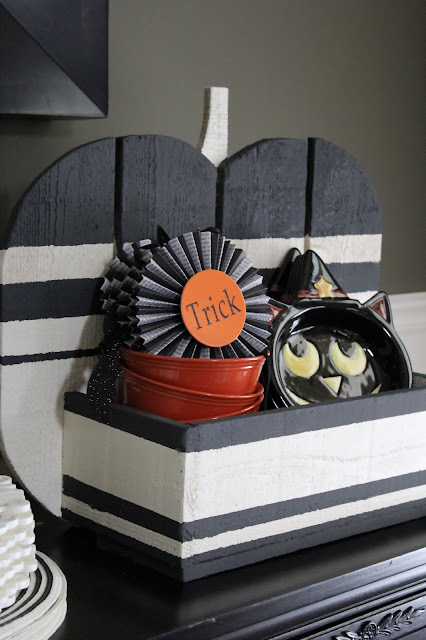 The other day, I shared the adorable Rustic Pumpkin Stand Project that is being featured at The Home Depot DIH Workshop this month (click here to register for the workshop near you). In that post, I mentioned that not only am I hosting a DIH Workshop in Grove City Ohio, but also that I would be sharing my very own customized version of the project right here on the blog. The Home Depot challenged me to make a DIH Rustic Pumpkin Stand for my dining room with my own personal touch on it. I turned my Rustic Pumpkin Stand into a super handy fall dining room entertainment caddy. I'm using it to store Halloween dinnerware and party supplies. We're officially ready for a party! My black dining room buffet is the perfect spot for my pumpkin stand. It helps me keep all my party supplies readily available and it doubles as festive fall dining room decor. I gave it a graphic striped paint job to make it stand out. 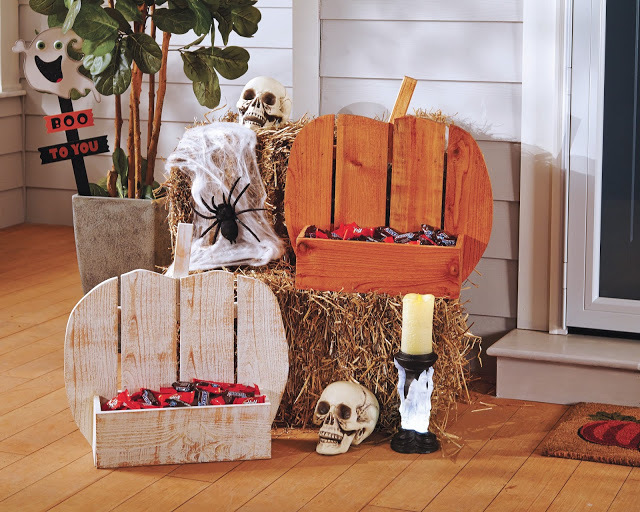 So many ideas came to mind on how I could use the Rustic Pumpkin Stand in the dining room. The entertainment caddy was the most functional thought I had, but I have to say this project is so versatile that it could be used so many ways. While I love how cute my Rustic Pumpkin Stand is and how useful it will be throughout the fall season, the most enjoyment I get out of this project is how simple it was to make. The satisfaction that comes from a DIY project that cost less than $30 and a few hours of time is unmeasurable. If you are not familiar with these workshop projects, let me tell you about them. The Home Depot DIH Workshops. are FREE, live, in-store workshops held at ALL of thier locations for Do-it-yourselfers of ALL ages and experience levels. These workshops offer step-by-step instructions on how to make simple DIY decor and home improvement projects with easy to operate power tools. Whether you are an experienced DIY-er or have never touched a power tool in your life, The Home Depot's Workshops are designed to provide a mix of associate-led instruction, demonstration, and some hands-on learning. Materials can be purchased to make your own project. (For more information please click here). First, I made my box a little deeper than The Home Depot version. I went with a 8" depth to accommodate a large stack of dishes and bowls. The other tweak I made was to paint my pumpkin stand with a striped paint treatment. 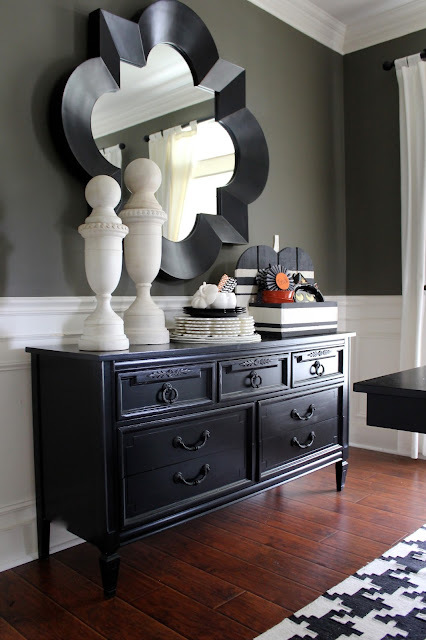 This was achieved by taping off different sized stripes with painters tape and filling in with Charcoal colored Chalk paint by Rustoleum. 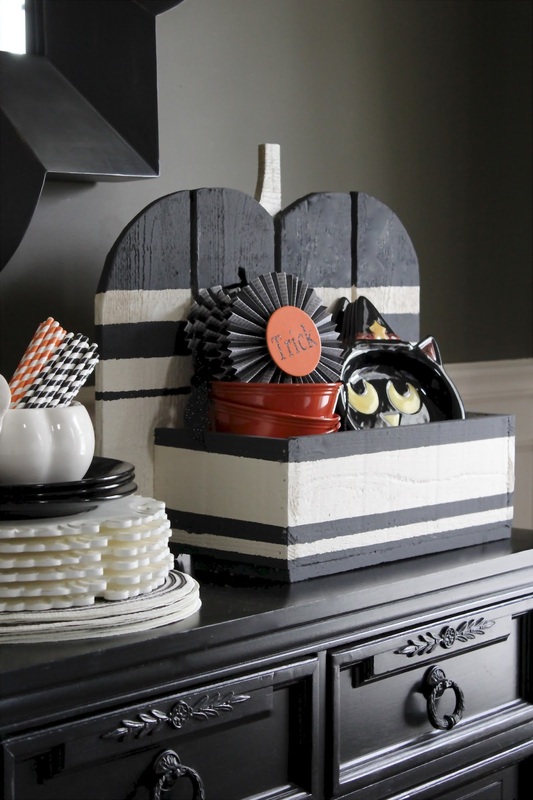 Once the paint was dry, I brought my Rustic Pumpkin Stand inside and filled it with seasonal dishes and party supplies. 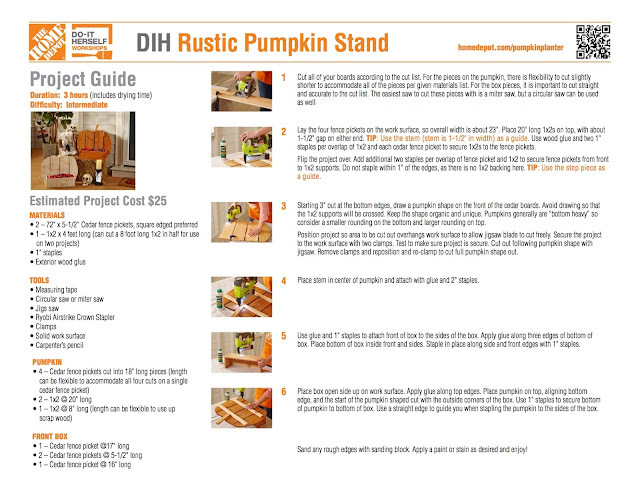 *In case you missed the announcement, I will be hosting the Rustic Pumpkin Stand DIH Workshop live from Grove City, Ohio located at 1680 Stringtown Road Grove City, Oh 43123. If you live in the Columbus Ohio area, I would love to see you there! Please don't forget to pre-register here. Love how you painted this! Totally different than everyone else's projects. And I like how you shaped your stem. I love it, Sarah! The black and painted stripes are perfect. Thanks so much for asking me to participate - I really appreciate it. It was a lot of fun! It looks great in your dining room. The black and white is beautiful! You know I'm a sucker for stripes, I love it! So cute on the buffet with your party supplies, what a great use for your pumpkin! Thanks again for asking me to join you, it was so fun! I love the colors & stripes of yours!! Pry my favorite yet, but all are so nice!!! Happy Tuesday,Sarah!